مرادی, امیررضا, شریفی, محمدعلی. (1397). Wavelet analysis of GRACE K-band range rate measurements related to Urmia Basin. مجله ژئوفیزیک ایران, 11(5), 43-54. امیررضا مرادی; محمدعلی شریفی. "Wavelet analysis of GRACE K-band range rate measurements related to Urmia Basin". مجله ژئوفیزیک ایران, 11, 5, 1397, 43-54. مرادی, امیررضا, شریفی, محمدعلی. (1397). 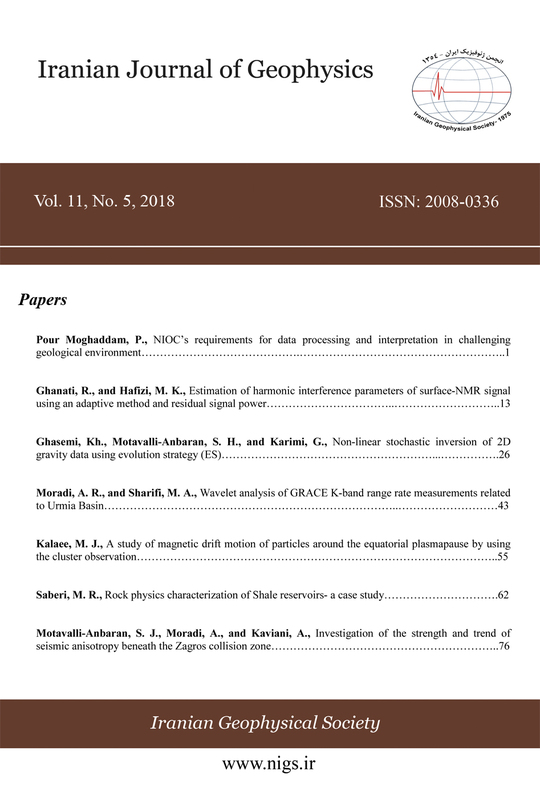 'Wavelet analysis of GRACE K-band range rate measurements related to Urmia Basin', مجله ژئوفیزیک ایران, 11(5), pp. 43-54. مرادی, امیررضا, شریفی, محمدعلی. Wavelet analysis of GRACE K-band range rate measurements related to Urmia Basin. مجله ژئوفیزیک ایران, 1397; 11(5): 43-54. Space-borne gravity data from Gravity Recovery and Climate Experiment (GRACE), as well as some other in situ and remotely sensed satellite data have been used to determine water storage changes in Lake Urmia Basin (Iran). As usual, the GRACE products are derived from precise inter-satellite range rate measurements converted to different formats such as spherical harmonic coefficients and equivalent water thicknesses of juxtaposed tiles in which the corresponding mass anomalies are estimated, resulting in missing information during these time-consuming processes. In this paper, GRACE level 1B K-band range rates related to Urmia Basin are corrected for non-hydrological processes and the resulting time series are analyzed using wavelet transformation. On the one hand, direct corrected range rates are employed to make an unevenly spaced time series. In addition, the monthly mean measurements of the same type are applied to create a uniform time series. Therefore, a wavelet-based least-squares spectral analysis method is introduced to extract the general behavior of irregularly sampled time series. In addition, the classical wavelet transformation is used to analyze the monthly averaged time series. The results indicate that the extracted coarse parts of the corrected range rates have significantly changed between 2007 and 2008, which are in good agreement with the total water storage (TWS) changes modeled in Urmia Basin, as well as with the similar previous research findings. Besides, the time-frequency behavior of both TWS changes and monthly averaged range rate time series show that the extracted annual constituents, as the main parts of the signals, have mainly weakened after 2007. Awange, J. L., Fleming, K. M., Kuhn, M., Featherstone, W. E., Heck, B., and Anjasmara, I., 2011, On the suitability of the 4× 4 GRACE mascon solutions for remote sensing Australian hydrology: Remote Sensing of Environment, 115(3), 864-875. Burrus, C.S., Gopinath, R.A. and Guo, H., 1997, Introduction to wavelets and wavelet transforms: a primer. Cao, Y., Nan, Z., and Cheng, G., 2015, GRACE gravity satellite observations of terrestrial water storage changes for drought characterization in the arid land of northwestern China: Remote Sensing, 7(1), 1021-1047. Case, K., Kruizinga, G., and Wu, S., 2002, GRACE level 1B data product user handbook: JPL Publication D-22027. Chen, Y., 2007, Recovery of terrestrial water storage change from low-low satellite-to-satellite tracking, Ph. D. Dissertation: The Ohio State University. Döll, P., Kaspar, F., and Lehner, B., 2003, A global hydrological model for deriving water availability indicators: model tuning and validation: Journal of Hydrology, 270(1), 105-134. Fatolazadeh, F., Voosoghi, B., and Naeeni, M. R., 2016, Wavelet and Gaussian Approaches for Estimation of Groundwater Variations Using GRACE Data: Groundwater, 54(1),74-81. Fatolazadeh, F., Naeeni, M. R., Voosoghi, B., and Rahimi, A., 2017, Estimation of fault parameters using GRACE observations and analytical model, Case study, The 2010 Chile Earthquake: Journal of Geodynamics. Frappart, F., Seoane, L., and Ramillien, G., 2013, Validation of GRACE-derived terrestrial water storage from a regional approach over South America: Remote Sensing of Environment, 137, 69-83. Forootan, E., Rietbroek, R., Kusche, J., Sharifi, M. A., Awange, J. L., Schmidt, M., Omondi, P., and Famiglietti, J., 2014, Separation of large scale water storage patterns over Iran using GRACE, altimetry and hydrological data: Remote Sensing of Environment, 140, 580-595. Han, S. C., Kim, H., Yeo, I. Y., Yeh, P., Oki, T., Seo, K. W., Alsdorf, D., and Luthcke, S. B., 2009, Dynamics of surface water storage in the Amazon inferred from measurements of inter‐satellite distance change: Geophysical Research Letters, 36(9). Han, S. C., Shum, C. K. and Braun, A., 2005, High-resolution continental water storage recovery from low–low satellite-to-satellite tracking: Journal of Geodynamics, 39(1), 11-28. Han, S. C., Shum, C. K., Jekeli, C., and Alsdorf, D., 2005, Improved estimation of terrestrial water storage changes from GRACE: Geophysical Research Letters, 32(7). Jacobs, D., 2005, Correlation and Convolution: Class Notes for CMSC, 426. Joodaki, G., Wahr, J., and Swenson, S., 2014, Estimating the human contribution to groundwater depletion in the Middle East, from GRACE data, land surface models, and well observations. Water Resources Research, 50(3), 2679-2692. Mirchi, A., Madani, K., and AghaKouchak A., 2015, Lake Urmia: How Iran’s Most Famous Lake Is Disappearing: The Guardian. Moradi, A., and Sharifi, M. A., 2016, Windowed Least-Squares Spectral Analysis of GRACE K-band Range Rate Measurements: Applied Ecology and Environmental Research, 15(1), 429-437, DOI: http://dx.doi.org/10.15666/aeer/1501_429437. Mulder, G., Olsthoorn, T. N., Al-Manmi, D. A. M. A., Schrama, E. J. O., and Smidt, E. H., 2015, Identifying water mass depletion in northern Iraq observed by GRACE: Hydrology and Earth System Sciences, 19(3), 1487-1500. Ngui, W. K., Leong, M. S., Hee, L. M., and Abdelrhman, A. M., 2013, Wavelet analysis: mother wavelet selection methods: Applied mechanics and materials, 393, 953-958, Trans Tech Publications. Rahimi, A., and Raoofian Naeeni, M., 2017, Source parameter estimation of Indian ocean earthquake from observation of GRACE Gravity Gradient Tensor: Annals of Geophysics, 60(6), DOI: 10.4401/ag-7394. Ramillien, G. L., Seoane, L., Frappart, F., Biancale, R., Gratton, S., Vasseur, X., and Bourgogne, S., 2012, Constrained regional recovery of continental water mass time-variations from GRACE-based geopotential anomalies over South America: Surveys in Geophysics, 33(5), 887-905. Rodell, M., Chen, J., Kato, H., Famiglietti, J. S., Nigro, J., and Wilson, C. R., 2007, Estimating groundwater storage changes in the Mississippi River basin (USA) using GRACE: Hydrogeology Journal, 15(1), 159-166. Rowlands, D. D., Luthcke, S. B., McCarthy, J. J., Klosko, S. M., Chinn, D. S., Lemoine, F. G., Boy, J. P., and Sabaka, T. J., 2010, Global mass flux solutions from GRACE: a comparison of parameter estimation strategies—mass concentrations versus Stokes coefficients. Journal of Geophysical Research: Solid Earth, 115(B1). Seoane, L., Ramillien, G., Frappart, F., and Leblanc, M., 2013, Regional GRACE-based estimates of water mass variations over Australia: validation and interpretation: Hydrology and Earth System Sciences, 17, 4925-4939. Sweldens, W., 1998, The lifting scheme: A construction of second generation wavelets: SIAM Journal on Mathematical Analysis, 29(2), 511-546. Syed, T. H., Famiglietti, J. S., Rodell, M., Chen, J., and Wilson, C.R., 2008, Analysis of terrestrial water storage changes from GRACE and GLDAS: Water Resources Research, 44(2). Torrence, C., and Compo, G.P., 1998, A practical guide to wavelet analysis: Bulletin of the American Meteorological society, 79(1), 61-78. Tourian, M. J., Elmi, O., Chen, Q., Devaraju, B., Roohi, S., and Sneeuw, N., 2015, A spaceborne multisensor approach to monitor the desiccation of Lake Urmia in Iran: Remote Sensing of Environment, 156, 349-360. Vaníček, P., and Wells, D. E., 1972, The least squares approximation and related topics: Department of Surveying Engineering, University of New Brunswick. Visser, P. N. A. M., 2005, Low-low satellite-to-satellite tracking: a comparison between analytical linear orbit perturbation theory and numerical integration: Journal of Geodesy, 79(1-3), 160-166. Voss, K. A., Famiglietti, J. S., Lo, M., Linage, C., Rodell, M., and Swenson, S. C., 2013, Groundwater depletion in the Middle East from GRACE with implications for transboundary water management in the Tigris‐Euphrates‐Western Iran region: Water resources research, 49(2), 904-914. Wells, D. E., Vaníček, P., and Pagiatakis, S. D., 1985, Least squares spectral analysis revisited: Department of Surveying Engineering, University of New Brunswick.